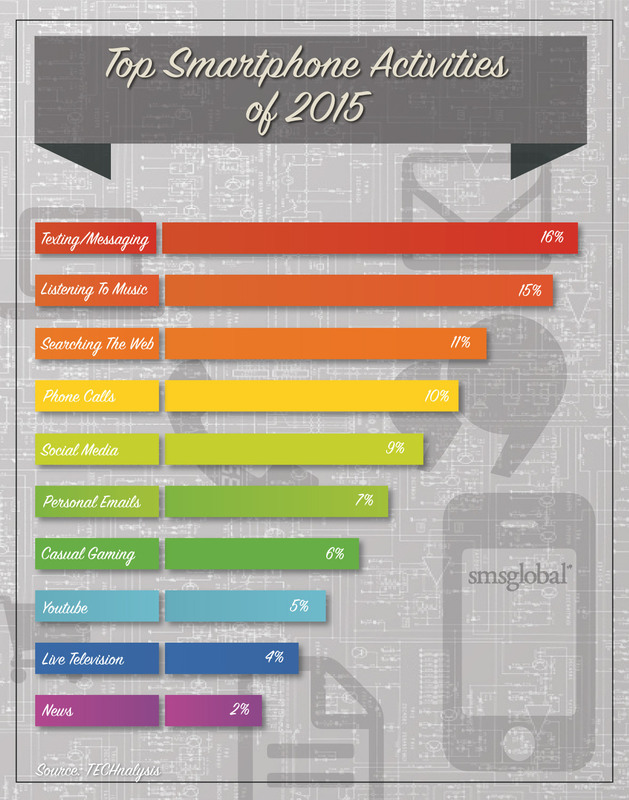 Just what are the top smartphone activities of 2015? There’s no disputing that the smartphone and all its variants have become an integral part of the modern person’s life. For proof of that you need only jump on a bus, tram, or train—or merely go to a public space—and look around. What you’ll find is people sporting bent necks, hunched shoulders, furrowed brows, concentrated eyes, and attention absorbed by a little glowing device held just in front of them, at the waist. The phone for many has become a sort of addiction. In fact, some studies have demonstrated that about two-thirds of people sleep next to their phones. More than that, thirty-four percent of people have admitted to answering their phone during intimate times with their partner; and one-fifth of people have claimed that they would rather go shoeless for a week than take a break from their mobile phone. There’s even a newly coined phobia—nomophobia (no mobile phobia)—a phobia of not having your phone in arm’s reach. This new mobile landscape has seen smartphones become extra important to businesses. Accordingly, marketing efforts now more than ever need to be conscious of and cater to the mobile platform, because the rules of the game have been changed. Which begs the question: what are people actually doing on their smartphones? To that question, there’s no foolproof answer. Nevertheless, a recent study of 2500 people from around the world (US, China, Brazil and the UK) conducted Bob O’Donnell—research CEO and Founder of TECHnalysis—suggests that texting/messaging is still the number one smartphone activity. We’re not sure whether this refers exclusively to SMS messaging, or if it includes other services like Viber or WhatsApp. In any case, with all the other bells and whistles that smartphones now have, good old texting (in some form or another) continues to play a key role in user habits. Coming in at number two on that list is listening to music. Listening to music on a smartphone isn’t always done in isolation; it’s quite likely that when users are listening to music they’re also surfing the web, checking emails, sending texts, playing games, so on and so forth. Nevertheless, it seems that for many, the smartphone is doubling up as an MP3 device. Oddly enough, actually making calls—which is arguably the primary purpose of the mobile phone—comes in at number four on the list of most popular smartphone activities. An important thing to note here is that the percentage of time people are spending on mobile apps in 2015 is 86%, with 79% of users saying that they use mobile apps almost every day. What this suggests is that the way in which people use their smartphones today is multifaceted, and although desktop/laptop habits don’t seamlessly reflect on smartphone habits, it reveals that we need to start thinking better about how we can make the most of this transition to mobile. On that note, there’s one thing in particular regarding that last point worth mentioning. Although people are spending more time on mobile devices than they ever were before, and although people are indeed looking for products and services using their phones—research suggests that desktops, laptops (and even tablets) continue to serve as consumers preferred method of actually making purchases. This is precisely the reason why we at SMSGlobal always encourage our customers to use SMS, not as a marketing end in itself, but as an access point that opens doors and creates a three-dimensional framework of a business for customers to explore in their own time. People are using their phones for a whole bunch of reasons. They’re also using their phones while on their laptops, or watching television, or reading a book—or all those things. A holistic, well-rounded approach to mobile marketing is the only way to go.